Democracy is in a state. This first UK solo exhibition by Vienna-based artist Katrin Plavčak comes at the start of the year that sees the United Kingdom on the verge of a dramatic break with the European Union, and will conclude during the final days – or not – of the Brexit process. Haus der Lose / House of Lots refers to systems of democracy, practiced since ancient Athens, whereby citizens selected by lot – through random sortition, rather than by public election – actively participate in what still function in certain countries as ‘People’s Assemblies’ that are convened to resolve the major issues of the day. 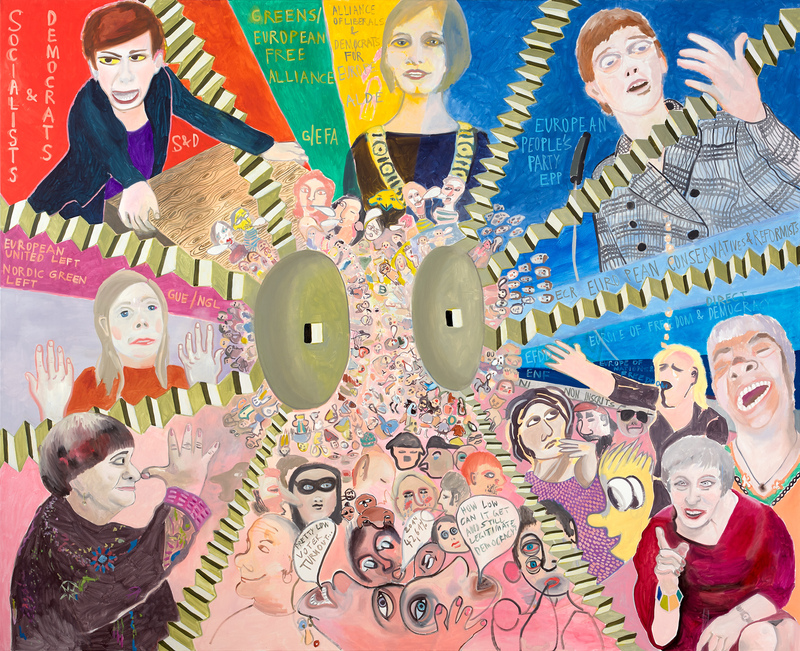 For this exhibition, the artist has painted a contemporary political landscape of carnivalesque horror; a world populated by a cast of grotesquely humorous characters, including real-life politicians, ‘sci-fi’ aliens, refugees, anthropomorphic objects, maps and cartoon beasts. Click here to read more about the exhibition and associated events.